If you're a fellow North Carolinian, Concord Mills mall is helping out fashion lovers like myself, with their first ever Accessorize Your Spring Sale! Now through May 31st, there are extra markdowns on top of the already low, outlet prices on accessories! From bags, to shoes, to sunglasses and more, there are so many choices to add to any outfit. They have some great stores like J. Crew Factory, Loft, Banana Republic, Brooks Brothers, TJ Maxx, Polo Ralph Lauren, Steve Madden, and so many more! Although I don't live in Charlotte, I go there quite often and I stop at Concord Mills on most trips I take to the Queen City. Yesterday, I stopped over there before a blogger meet-up (more about that in another post!) to check out this great sale! 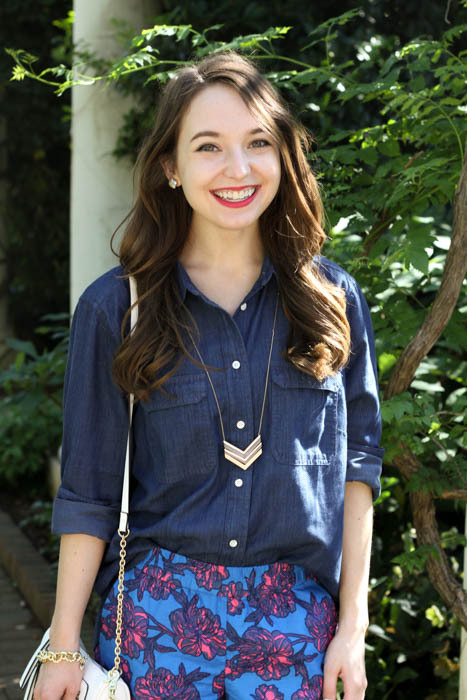 They gave me a chambray shirt from the Loft outlet to accessorize, and here is how I styled it. The folks at Concord Mills have put together 4 must-have accessory trends for spring: florals, metallics, stripes, and cobalt. Today I'm choosing to share two of these trends with my picks that I just got on sale from Concord Mills. To quote Miranda Priestly of The Devil Wears Prada, "Florals, for spring? Groundbreaking." 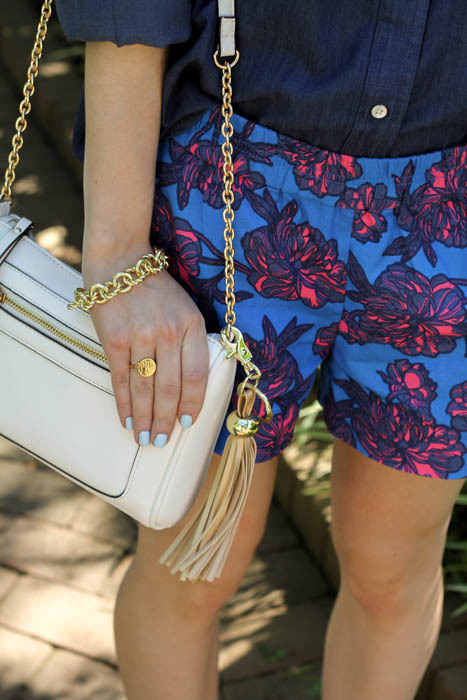 It's sort of goes without saying, nothing says spring like florals! And it doesn't only go for the ladies, men can wear florals too in a tie or pocket square, perfect for a spring wedding. In this outfit I found these shorts from J. Crew Factory at Concord Mills, on sale for $25. They are so comfy, and how fun is this print? My favorite kind of neutral, metallics can add so much to an otherwise boring outfit. In this outfit, I'm wearing a brass and pewter necklace from the Loft outlet (on sale for $), a gold bracelet from J. Crew Factory (on sale for $15), and a gold tassel from the Loft outlet on my bag (on sale for $), from Forever 21 (on sale for $22). Lately, I have been really loving the alternative metallics like rose gold and gunmetal! I clearly already have a stripe obsession (if you don't believe me, this post and this post just from the last 2 weeks may help), so I fully support striped being included in this list of spring trends. They can be put on just about anything for girls or guys, and can easily be mixed with lots of other prints for some pattern play. 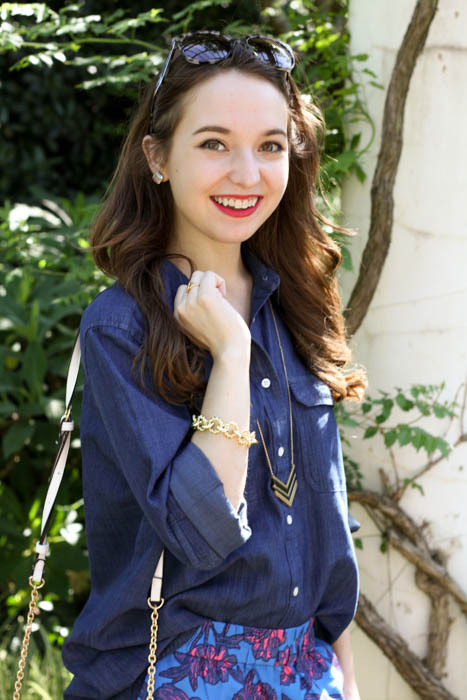 I've always loved wearing cobalt, like in this post and this post. Although for me it's a little tough to style. But, I love finding a great cobalt piece, it's just such a fun and vibrant color. My favorite colors to pair it with are white, yellow, and pink! What is your favorite accessory trend for spring?